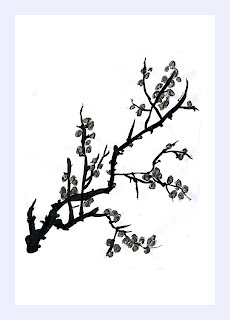 It stood in the yard of a small Georgian court - a flowering cherry, Prunus Ichiyo, tall with spreading branches and snow-dusted buds, like an Kyoto fan etched against a sky of new Spring blue. There was no garden there in the yard, just the tree. No-one knew who had planted it or how, in an old neglected part of Leeds with stones stained ugly black by two hundred years of industrial pollution, it had survived. But survive it had and become as much part of the life of Salamanca Court as that of Number 4’s ninety year old Mrs Sewell. The tree reflected both joys and grief. In the chill sad days of early February it was hung with black streamers to mark the passing of Deaf Jonty, born, lived and died in Number 1. Pritam, dark eyed and beautiful, was born in March and the tree was decorated with blue ribbons. Although the quiet Guptas at Number 10 did not know why the ribbons were blue, they saw their baby son thus made welcome to the Court. She thought about Jonathan and Gary of Number 3 who held their September wedding party out in the yard. The tree was hung about with pink hearts and everyone got drunk and danced long after midnight. She remembered Middle-Aged-Mercy, the Quaker lady at Number 6 who last October hung a banner on the tree saying: “Save Our Planet” and all the neighbours threw coins into her Save our Planet Bucket. As if not to be outdone in generosity, the tree rained down purple-red leaves, a rich carpet spread over the cold black ground. In November Rocheen refused to go to a retirement home in Headingley. She did not want to leave the Court where her life and the lives of her neighbours seemed all bound together within the life of the tree. For Divali there were firecrackers and lanterns round the tree; the Levine boys dug a hole between its roots as a hiding place for their Hanukkah gelt. As the year neared its turning, Pagan Morganna made the Solstice fire outside Number 11 and the tree’s branches turned dark red in the glow of the flames. In its Christmas coat of gleaming tinsel and silver bells it lit up the cottages of Salamanca Court like a great Star of Bethlehem shining over them all.